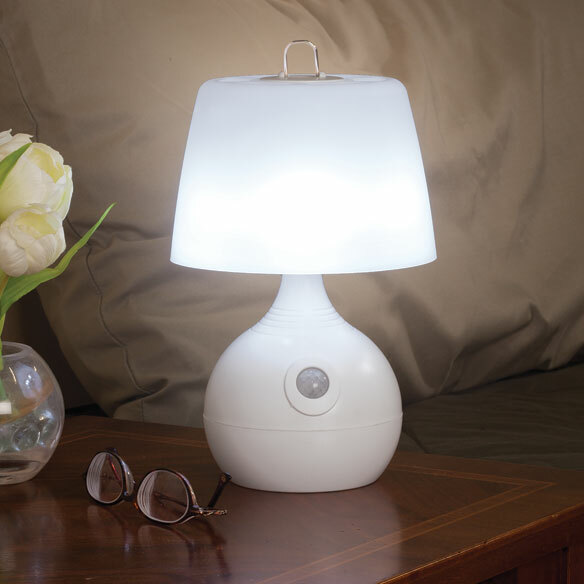 12-LED motion sensor table lamp helps prevent trips and falls when light is low. Wireless lamp’s 12 bright LEDs automatically switch on when motion is detected and switch off after 1 minute without movement. Motion sensor light features 3 glare-free light modes: nightlight, daylight, or automatic motion sensor, which is meant for dark or dim lighting. Charming cordless design is perfect for any room. Top hook for easy carrying outdoors or in a power outage. I use Motion Always...Great for walking into Great Room at night....Illumination is excellant! I really like this lamp. Perfect illumination and additton to my bathroom. Highly efficient. Excellent product at night. Illums well. I set motion detector at night for those who get up for necessities at night. It is also used on the mantle adjacent to the stairwell and it provides extra light at night. Meets all my expectations and then some. A little but powerful product which meets my needs. I love, love, love this!!! Perfect for hallway between bedroom and bath. We were originally given two lamps as house warming gifts. We liked them so much in our new country home, we ordered four more. They are great as night lights, to use in out buildings and for emergency lighting, to name a few of the practical uses we've found for them. I have one and my friends wanted one. Have had one in the past - it eventually burned out. This is so handy in the bedroom for getting up at night. My dad needs a new lamp. He wants the motion sensor so the light will automatically light his way to the bathroom. It is battery operated so it is great for power outages. I chose this because my husband needs a light at night when he gets up. I thought this would be great, he wouldn't have to fumble for a switch. I am the bionic grandma...have had shoulder and knee and foot replacements or reconstuctions...this lamp makes my life much easier! Saves Electricity, also good if there is a power loss. When I shut the lamp off by my chair at night, this comes on to guide me to the hall light. Convenience to walk into a lighted room. My lamp burned out and saw this one and thought it might be perfect for my needs. 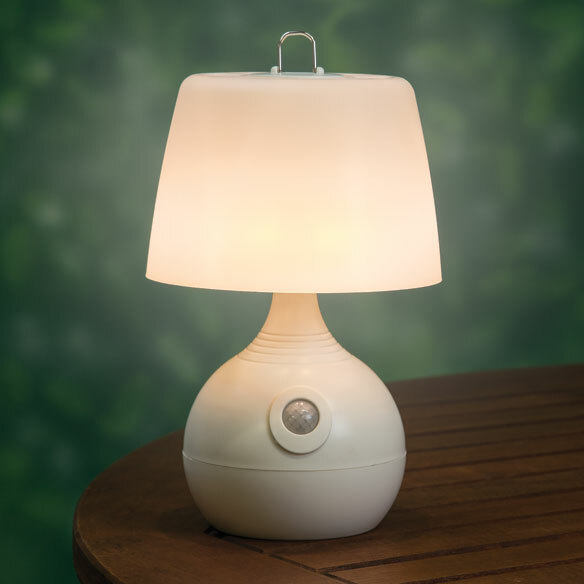 The lamp is very convenient as a night lamp and emergency lamp. I already have 2 of them for entrance ways and dark areas. Have some difficulty getting out of bed (half asleep) during the night and hope this helps in finding the light switch. Bought one for a friend and she loved it so much she wanted to get it for 2 of her friends. Since my husband has vision issues, it should make it easier when he gets up at night and will not have to search for a light switch. what is the lamp made of? BEST ANSWER: Lightweight plastic. We all LOVE it!! The first one we placed on the floor in an area we pass frequently in the dark where people tend to leave their items on the floor when they come in so we see them and don't trip. It stays on 30 seconds or as long as movement is occurring. It also has a hanging hook. It has MULTIPLE settings which I;m not sure the catalog mentioned! With LED bulbs and C batteries, we think it will last for several months before the batteries die, but since we just started using them I don't know yet. It also works perfectly if the room light is dim - it doesn't have to be totally dark. We might be the only people to use them to prevent tripping, but we LOVE LOVE LOVE them and will order more for hurricane season in SC and winter storm power loss in GA. Be aware however that the ANGLE in which it detects motion is only about 60-75 degrees, not 180. The light is bright enough you can write, prepare food, etc. I think all elderly people should have several in case of power loss. It's nice not to have to hold a flashlight while walking around. A very very hard plastic type material. Very light weight.